Like it or not statistics and damn lies are part of the craft industry. Maybe the damn lies part of it isn't a big thing, but paying attention to stats has become part of the game as the industry matures. Mark Twain would be proud. Some of the more interesting stats on Oregon beer are out there for pubic consumption on the OLCC site. There you can look at monthly reports documenting production numbers for the state's breweries. The reports are a few months behind. February 2014 was just published. It's the Year-To-Date comparisons that tend to interest me. That's what we're looking at here. Who's showing a significant increase or decrease. To get that view, you have to pull up reports a year apart. Looking at the side-by-side numbers can be daunting. Visuals are a lot easier. So I created some charts. The first chart looks at percentage change in production among the top 20 or so breweries in the state. This is a meaningful visual in some sense because it tells us what's happening at the top, where most of the volume lives. It's a big part of the overall picture. You have to be somewhat careful because some of these numbers can be deceiving. Why? Because they're relative. For instance, Worthy's spike looks huge. But the 208 percent increase represents just 510 barrels. By contrast, the CBA's 25 percent drop represents 3,721 barrels. Enough said. Another thing to keep in mind as you look at this chart is I eliminated breweries with small changes for the sake of easy viewing. Deschutes production dropped by roughy 2 percent, representing 215 barrels. I didn't include them. I also didn't include Rogue, down 1.14 percent, or Full Sail, up 1.66 percent. These to me are insignificant numbers. The takeaways? Worthy and Breakside obviously show big growth. Breakside opened a production brewery in 2013; Worthy was just ramping up production. They're both gaining production momentum now. As noted, keep in mind that these numbers are relative. 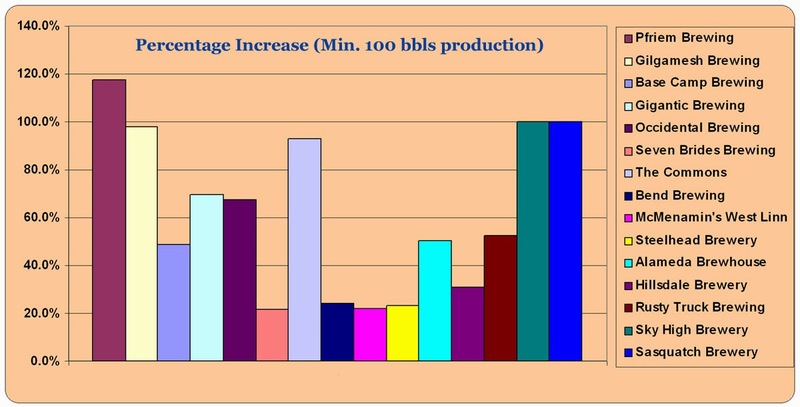 Worthy and Breakside aren't the biggest winners when it comes to increased production volume (see below). I have no idea what happened with the CBA or Bridgeport. Ninkasi's drop may be related to efforts to increase capacity. Laurelwood's drop makes sense because they have shifted a lot of production to Redhook's facility in Woodinville, Wash. They're still brewing Workhorse, Free Range Red and others for 22 oz bottle distribution, but the heavy lifting has mostly shifted. I should mention a couple of notable exclusions. Pelican, Good Life, Baker City and Ecliptic show no numbers of February 2013 so nothing to compute growth. Ecliptic wasn't yet open. Pelican and Baker City have shifted to production breweries that didn't exist a year ago. I do not know what happened with Good Life...a missed report, perhaps. Their production is up significantly since early 2013. 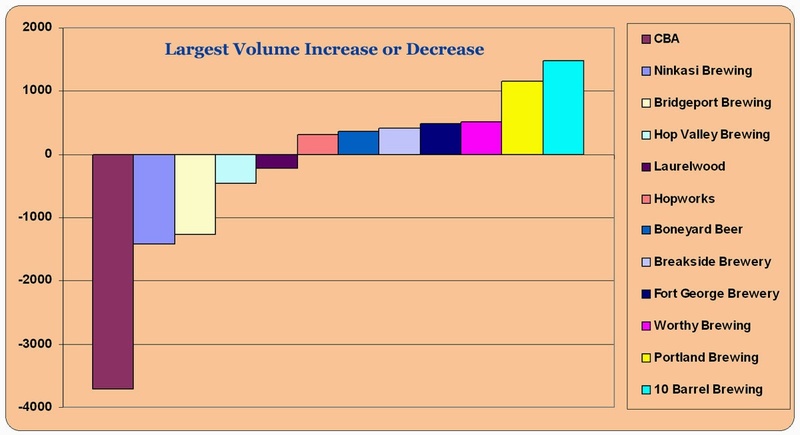 This may well be the more meaningful chart due to the fact that it shows actual volume increase or decrease. I only paid attention to the biggest changes to keep it simple, so you're only looking at breweries where there has been significant up or down movement. I probably should have left out the CBA; that one data point skews the grid dramatically. Hop Valley shows up as a loser here because they shifted to a production brewery and downscaled production at their pub. Ninkasi, Bridgeport and Laurelwood I've mentioned. In terms of the shops showing growth, I suspect Boneyard would have shown a greater increase, but they're maxed out where they are. Worthy and Breakside, as noted above, are what they are. Fort George is moving up quickly, Portland Brewing is a big surprise. They must be contract brewing something. Perhaps someone will chime in about that. Pelican, Good Life, Baker City and Ecliptic surely would have shown up here had there been 2013 data to compare. A final caveat here is that volume doesn't necessarily equate with profitability. Producing a product that makes a good profit involves more than just brewing a great beer. There are branding and marketing issues that play into that. Some breweries make more money by keeping production and distribution down. Food for thought. This last chart was a sort of afterthought. There are a number of smaller breweries out there that are growing rapidly. I thought it would interesting to look at them in context of each other. As in the first chart, we're talking about percentage increase, not volume. To be considered, breweries had to have at least 100 barrels of YTD production in February 2014. I did that to eliminate places that brewed, say, five barrels a year ago and are now brewing 10 or 20. That growth is significant for them, but insignificant in the larger scheme of things. 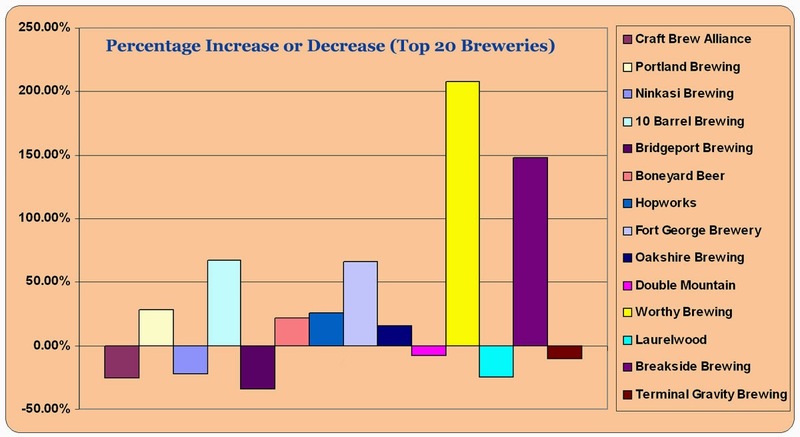 Breweries also had to show 20 percent growth or more. There's nothing that surprising here. Pfriem is a rising star, for sure. The Commons, as well. Gigantic has been solid since it launched in 2012. Base Camp is a bit of a surprise, but they're apparently doing just fine. I should mention that Rusty Truck, Sky High and Sasquatch snuck into the mix at or just above the required 100 barrels of YTD production in February. These charts are offered strictly for comparison and information. They do not tell much more than a partial story. Craft beer in Oregon is in a constant state of flux and the numbers for these breweries will likely shift around fluidly as the year moves along. I'll try to remember to update these charts in five or six months, when the picture for the year is a little sharper. Well, maybe it will be. Update: A few people have contacted me pointing out that OLCC numbers reflect beer produced and sold in Oregon. Keep that in mind as you view these charts. I can certainly think of breweries who are selling a lot of beer outside Oregon, production that does not show up here. I love charts and numbers but sometimes these things are overwhelming. Thanks for taking the time to break them down and point out the big important points while tossing out the clutter. Charts are much easier to look at than numbers. Trying to compare YTD spreadsheets just looking a numbers is tough. The charts are a lot better. But even they are somewhat deceiving, I fear.